18 Severed Heads Discovered at O’ Hare International Airport! Ever leave the house knowing you forgot…something? We’re wondering what it was like when the guy who was supposed to file paperwork for 18 human heads for medical study realized that he’d forgotten to file paperwork for 18 human heads for medical study. One week before Santa Claus was to descend on the world with a bag of awesomeness, 18 well-preserved human heads showed up at O’ Hare International Airport with no explanation….just a bunch of questions. It wasn’t until an employee from a crematorium came to pick up the heads that things became clear. Tagged as ‘medical specimens’, the heads had originally shipped from the US to Rome for medical study and were coming back to the states to be cremated. 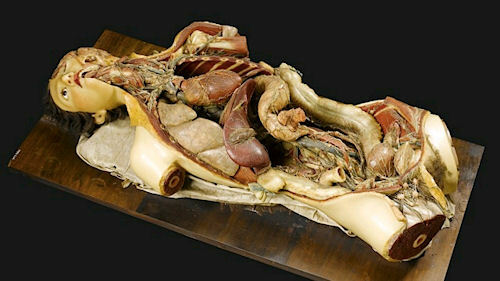 Disturbingly Detailed 17th Century Wax Anatomy Models Go On Display! Long before we were able to see inside people with x-rays, tiny cameras or accurate 3D models doctors still had to know what pieces we were made up and where they went. Students learning anatomy didn’t always have the luxury of a bunch of fresh cadavers to study either. Enter the wax anatomy model. During the 17th century, there wasn’t any way to learn anatomy unless someone died and their body was immediately trucked-in fresh for people in disciplines that needed to study anatomy. Instead, artists began creating anatomy models out of wax. The intricacy of these models is unsettling and creepy but also amazing because of the stunning extent of the details. Many of these wax models featured things like a removable chest, face or vital organs which, when removed, would reveal even more gruesome details of our inner anatomy. A lengthy but disturbingly interesting write-up about the details of these models, including photos, was posted on the Journal of Anatomy way back in 2009. Why are we talking about them just now? Well they’re currently on display at the Museum of London. Often called ‘Venuses’, referencing the Venus Di Medici statue created by an unknown Greek sculptor, most of the models were female forms and several were put in often nightmare-inducing poses. What do we mean about nightmare-inducing? How about a pregnant woman showing her womb in operation by pulling back flaps of skin on her belly. Doctors Put Woman’s Skull In Her Belly! Hell’s Canyon is a name where you actually expect weird stuff to happen on a regular basis. Knowing that Hell’s Canyon is in Idaho only makes it worse. For 36 year-old American beauty queen Jamie Hilton it got worse. During a fishing trip to Hell’s Canyon with her husband, Jamie stumbled and slammed her head causing severe swelling and other complications. In an attempt to save her life, doctors removed a quarter of her skull to prevent the swelling from causing any more damage. When the mother of three, a former Mrs Idaho, woke from the operation she found a lump in her stomach and a large portion of her head missing. Mrs Hilton posted a photo of the skull in her abdomen on her blog entitled ‘Miracles… believe in them’ as well as a photo showing a scar running the length of her head. That’s where her little skull-friend stayed too…for 42 days! Using industrial strength staples, doctors stapled the skull piece back into place, sewed her pretty little noggin’s fleshy covering back up and called it a day. Jamie is currently in recovery, doing well and happy as can be. Guess who’s going to be the ‘astronaut at the table’ when it comes to her interview at the next beauty pageant? Yup…the chick who carried her own skull in her belly like a baby. Glasses Allow You to See Your Veins! 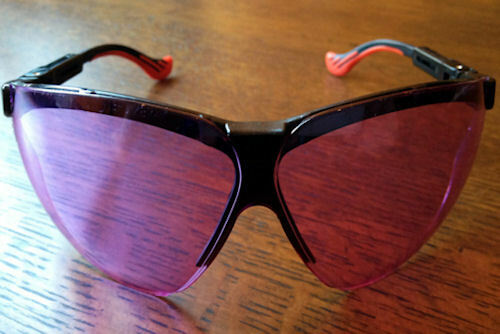 Tech-heavy eyewear has always been something that seems like too good-to-be-true science fiction. Various accessories promising amazing visuals for your peepers have included everything from those vintage ads in comic books for X-Ray Specs to the recently buzzing Google Glasses to quantum HUD display mechanics contained in a single drop of saline dripped onto a contact lens. Currently in their testing phase, 2AI Labs is developing a pair of glasses that allows you to see what early testers are having a hard time believing until they actually put these things on…and see their veins glowing. The O2Amp glasses are the creation of neurobiologist Mark Changizi who came up with the idea while studying the development of color vision in primates at CalTech. So how does this work exactly? Bionics? Special computer-controlled lenses? By bellowing latin phrases and waving a wooden stick? Nope. Our eyes, using certain filters, are able to do this all on their own. Turns out we just have to amplify the process. 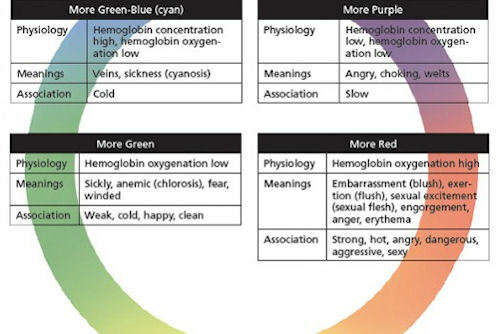 – A general clinical enhancer, or oxygenation-amplifier, that combines the best features of the first two; it eliminates neither signal (i.e., it retains perception of both variation in Hemoglobin oxygenation and concentration), and only amplifies perception of oxygenation. Unlike Google’s somewhat infamous video of promises regarding its magical glasses, these amazing goggles are already out in the world, mainly in the medical field, and being tested by real people working in a real evironment. The results and feedback from those that’ve worn them? Most are ready to order. First Successful Face Transplant Revealed! 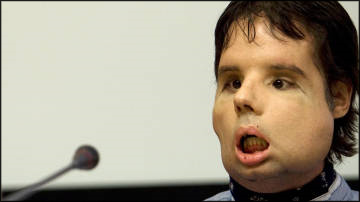 The world’s first successful face transplant patient has revealed his improved face in Barcelona this week. Known only as ‘Oscar,’ the patient thanked the hospital and the face-doner’s family for the medical breakthrough that will eventually allow him to regain up to 90% of his facial functions. Unfortunately, ‘Oscar’ looks nothing Nicholas Cage OR John Travolta. See, kids? Sometimes even movies lie. This past Friday North Korea announced a new “Super Drink” that purports to give consumers a longer and healthier life. 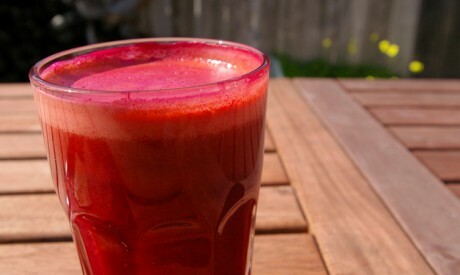 The drink is made from 30 different plants and contains 60 different “micro-elements” to allegedly multiply brain cells, reduce geriatric diseases, protect skin, and reduce the effects of aging. This is all according to the North Korean Government’s news agency so stay skeptical, but the product does claim no side-effects. Considering it’s basically a bunch of plants thrown in a blender that’s probably true, but don’t be surprised if you start glowing in the dark from either awesome new super powers or radiation poisioning. Who wants to try it first?